Proceedings commenced on Sunday 22nd October and concluded on Sunday 29th October 2017; it was a return to the city where as a player I had represented Pakistan in 1988 and 1991 ib the Asia Cup. I arrived on the afternoon of Monday 21st October, Mr. Ting Ladesma, President of the Philippines Table Tennis Association was there at the airport to receive me. 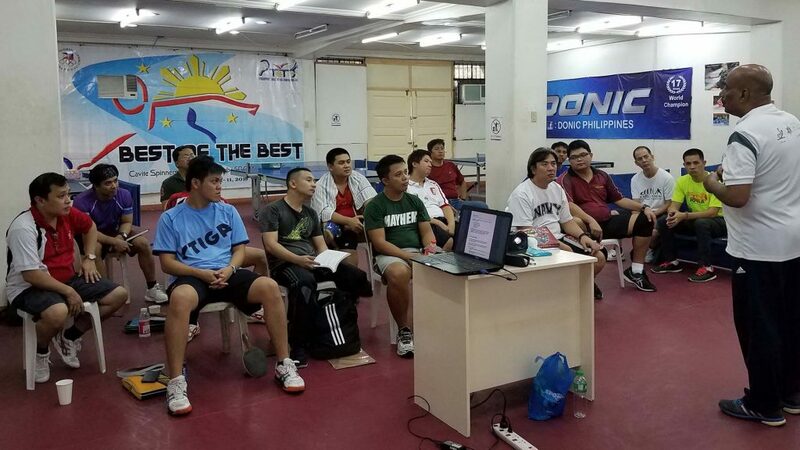 Notably previous ITTF/PTT Level One Courses had been held in the Philippines, first in 2008 led by Polona Cehovin Susin, the second in 2014 under the direction of Christian Lillaroos. As per schedule the next day at 10.00am, I started the five day ITTF/PTT Level One Coaches Course, a total of 15 coaches attended coming from various provinces in the country, the good thing about this group was that almost all the coaches were former table tennis players and therefore had quite a good knowledge of the game. During the five days course all the coaches were very punctual and were very involved; the interest level to learn was very high; all the coaches passed the practical test. Rodel Ireneo P. Valle, four times Men’s Singles national champion and international player emerged the best coach. Following the ITTF/PTT Level One Course, I conducted a two day training camp for the national junior players, six boys and two girls participated. The group included Jann Mari and Janna Romereo, both very talented juniors. 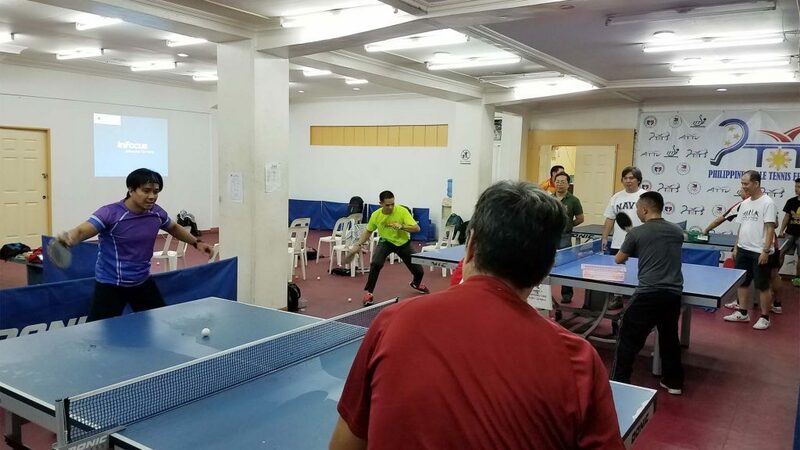 At the training camp I saw that the level of the junior players in Philippines is quite good; I think the Philippines Table Tennis Federation under the leadership of Ting Ladesma, is making progress. 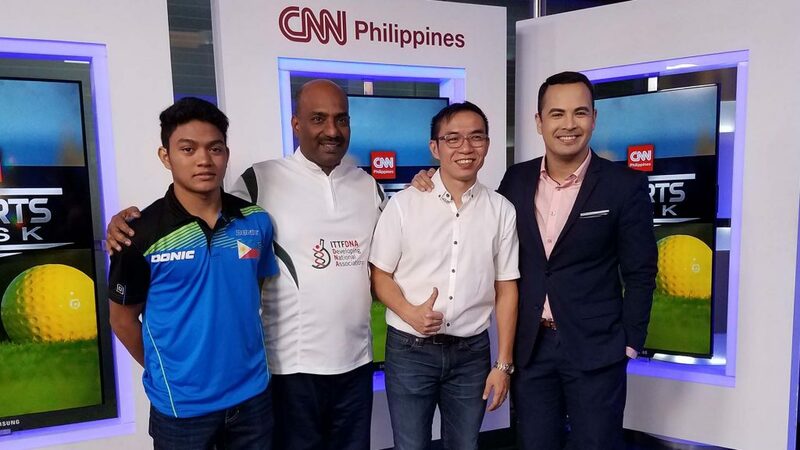 Importantly we gained good media coverage, Ting Ladesma and myself were invited by CNN Philippines for an interview, I think it was not only good coverage for table tennis in Philippines but for the world over. During my stay I was very fortunate to have the chance to meet Jan Lariba, the only table tennis Olympian from the Philippines, the pride of the nation. She is suffering from Leukemia. I was told that she is a very humble and softly spoken person, I found that out right away when I met her, right after the greetings the first thing she said to me was please Mr. Arif sir, please I want to thank the ITTF from the bottom of my heart for coming out to help me so generously; without the help of ITTF and all the others my treatment would not have been possible. The treatment and the whole procedure is very expensive. It was only the previous week earlier when she had a bone marrow transfusion procedure taken from her sister, I asked her how do you feel now and what are the doctors saying. Wearing a mask she explained the doctors are happy with the results and slowly she is starting to feel better. I wished her a fast recovery and good health on behalf of the ITTF and the whole table tennis fraternity and myself. Importantly, Ian Lariba needs more financial help to continue her treatment so it is my humble request to kindly come out to help her if anyone wishes to do so. Also, I also had a chance to meet Mr. Jose Cojuangco Jr, the President of Philippines Olympic Committee. He invited me and all the ITTF/PTT Level One participating coaches along with Mr. Ting Ladesma, to his house for a high tea. Present for this occasion was the Mr. Stephen Hontiveros, the Secretary General of the Philippines Olympic Committee, Wencelito Andanar, Legal Affairs Adviser plus and Mrs. Annie Andanar, the President’s Assistant at the Olympic Committee. Mr. Jose Cojuangco Jr and all the officials thanked me for doing a wonderful job and told me to specially thank Mr. Thomas Weikert, ITTF President and Mr. Glenn Tepper, ITTF Deputy Chief Executive Officer for helping the Philippines to develop and promote table tennis. He expressed a distinct wish that the co-operation will continue.